William Woods University's impact reaches far beyond the boundaries of Fulton, Missouri. Our alumni are doctors, lawyers, teachers, athletes, and most importantly, leaders in their communities. 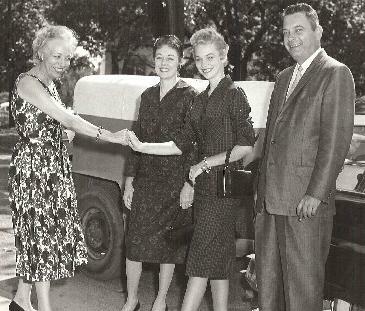 Whether you arrived to campus in 1959, like Carolyn "Cookie" Cain Hanson '60 (pictured here with her parents and recruiter, Ruby) or you are a millenial who just graduated and entered the professional working world, you are part of a large community of alumni who are eager to keep their WWU connections strong throughout life. Your membership in the WWU Alumni Association was automatically granted to you upon the completion of your degree or at least 2 semesters of full-time enrollment. The association offers special services and a worldwide network for alumni fellowship. In return, alumni are encouraged to support William Woods and volunteer time and resources to serve their alma mater. It is the dedication and loyalty of proud alumni that allow universities to flourish. We hope you will join us in furthering WWU's commitment to achievement and excellence.